In a departure from pretty much all of our norms, we went to Las Vegas this past weekend to celebrate a friend’s big birthday because… why not? Possibly needless to say, my opportunities these days to take long plane rides with no kids, lounge by pools long enough to finish books, uninterrupted even, and spend exactly zero minutes searching for or scrubbing sippy cup parts are scarce and when graced with a chance to do all of the above at once, it took half a second to book our tickets. Also needless to say, I could now use more sleep, less gin, and to reintroduce my system to fresh fruits and vegetables. This probably means we did it correctly. I’m glad I did at least one semi-wholesome before I left, which was to make a big satisfying sheet of granola in the format of breakable “bark.” This comes from the new cookbook, Tartine All Day from Elisabeth Prueitt, half of the duo behind the famed bakery in San Francisco. To say I have been excited about this book would be the understatement of the season. Ever since I discovered Prueitt’s Instagram last year, where she shared the bits and pieces (with recipes!) of what she was fine-tuning for this book, I had a running list in my head of recipes I couldn’t wait to get to, and some I couldn’t even wait that long for. Also in this book, an apple beehive* that will torture me until good apples are back in season in New York; a 5-day sauerkraut, cider caramel ribs, and crispy waffles** also made the shortlist, but I’m glad I got to this first because it’s been way too long since we had a new granola recipe here and this one ticks all the boxes: not too sweet, good crisp, but not tooth-breaking crunch, and if you’re in it for the big chunks, you know, the ones you fish out of the jar first (of course you do), you’re in for a treat because this is basically all-cluster granola. * I really want to try a savory version with potatoes. I mean, it’s been a whole two weeks since my last major cooking flop so why not, right? ** Incidentally, the book is also gluten-free but something I enjoyed about it is that you can flip through and barely notice it; it’s not the focus of the book, simple a fact because Prueitt tends to a gluten intolerance. Wheat-based recipes are the inspiration and reference point; this is more apparent in the baking recipes, of course. Most questions about granola recipes are about substitutions and this one, particularly ingredient-rich, will probably have many. I made it to the letter so I cannot promise that all swaps will work however, it is my hunch that when it comes to granola recipes, what makes them work is keeping the balance of wet to dry in check, with an eye to the size of the ingredient. Thus, seeds or finely chopped dry ingredients usually swap out well for seeds, nuts for nuts, and sugars for sugars and often, unlike most baking recipes, swaps done by volume (i.e. 1/4 cup for 1/4 cup) are more successful than those done by weight, which can make things easier. Let us know what variations you try and how they come out; these comments are invaluable to everyone. Prueitt notes that the granola bark works without the egg white, but it’s more crisp with it. Combine maple syrup, sugar, water, vanilla and salt in a small saucepan and bring to a boil, stirring to dissolve the sugar and salt. Remove from heat and let cool to lukewarm. Meanwhile combine cinnamon (if using), oats, almonds, coconut, seeds, almond or hazelnut flour in a large bowl. Heat oven to 325 degrees. Line a rimmed half-sheet (13×18-inch) pan with parchment paper or a silicone mat. Once liquid mixture is back to room temperature, whisk in olive oil, which will cool it further, then egg white. Pour over dry ingredients and mix well. Spread mixture evenly across the prepared baking sheet. Press down firmly to compact it before baking, using another same-size baking sheet or the bottom of a pot. Bake for 40 to 50 minutes, until dark golden brown, rotating the sheet every 15 minutes to promote even browning. While it bakes, open the oven door a few times to release steam. Set on a cooling rack until surface of granola is crisp. Leave oven on. If surface is still tacky to the touch once it has cooled — although I didn’t find this at all — return the pan to the oven and continue baking for another 10 to 15 minutes, checking every 5 minutes. Don’t let it get too dark or it tastes bitter. Once totally cool, break into pieces in store in an airtight container at room temperature for up to 2 weeks, or in the fridge up to 1 month. I’m going to Vegas in a couple weeks with my girlfriends. Would love to hear a few of your food recommendations! :) Thanks! We actually did do any planning at all; my friend booked everything and we were only there for exactly 48 hours. But, we went to Jaleo, which I’ve always loved in DC, and also Bazaar Meat (we have a thing for Jose Andras, obvs). We were so excited to go to In-and-Out on the way to the airport yesterday and completely forgot it would be closed for Easter; we’re pretty smart. Don’t miss the Neon Museum. Three recommendations we didn’t get to: 1. Frozen custard at Luv-It (specifically the Scotch Jimmie), 2. Tacos El Gordo and 3. Lotus of Siam. This is awesome–thanks! I saw your post on instagram about the neon boneyard, so I’ve already suggested that to my friends :) Looks super cool! Fyi, there is now an In-N-Out Burger right on the strip on the Link Promenade. Could this be kept in the freezer to extend the keeping time? Good thing I just impulsively bought coconut sugar. I’ve got almond meal but not flour. I’m thinking it should be ok – any thoughts? I thought they were the same? (I’m about to find out…) Regardless, I think your swap will be fine. From what I understand – almond meal is a little bit coarser and generally has the skins (The Kitchn did an article a little bit ago: http://www.thekitchn.com/whats-the-difference-between-almond-flour-and-almond-meal-205771). I grew up always using almond meal (for passover desserts, etc.) but Trader Joe’s sells both now. I’d guess in something like this it would work more or less the same way – but I know when I used it in Dorie Greenspan’s Biarritz cookies recipe, there was a visible difference from her almond flour version in the book. Still tasted great though. I really wish you hadn’t mentioned that because now I can’t get it out of my mind…. Ditto, I was thinking it would be wonderful, especially for people who eat granola more as a snack and less as breakfast. While that is an excellent suggestion, and one I will certainly try, I have always been partial to adding some cocoa powder to my granola. You don’t need that much to get a nice chocolatey flavor, so you probably don’t even need to swap it for some of the dry ingredients – but that’s a possibility. I think with 3 cups of oats, I’d use at most 1/4 cup of cocoa powder. It’s chocolatey but nearly calorie-free. Makes really nice chocolate milk, if you’re eating your granola with milk like cereal. Sometimes I add carob powder to granola before baking. It’s good. My niece makes fab granola and she adds cacao powder with the dry ingredients, about 1 tbsp. It tastes really chocolatey, and (obvs) yum! You could also add some instant espresso powder if you eat it mostly for breakfast. I like to have breakfast options that include a bit of caffeine but don’t necessarily require brewing coffee. Melted dark chocolate and drizzled in chevron pattern while still warm. Delicious, if you can’t wait till chocolate hardens, put in fridge for a few minutes. Looks really tasty…more like something to nibble on (like a granola bar) than something you pour milk over for breakfast…but maybe I am mistaken? Do you think dried fruit could be added at some point, like raisins or dried cranberries? 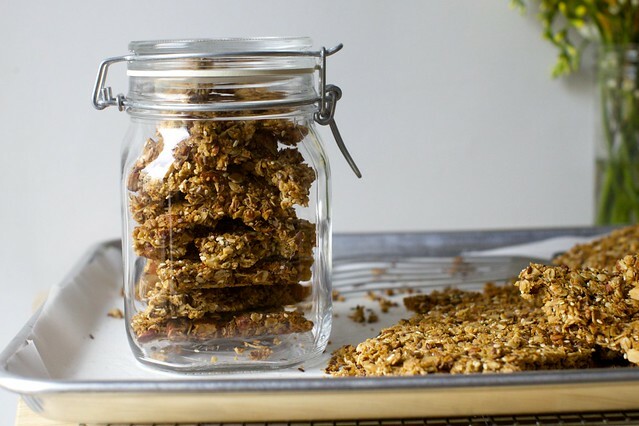 Thanks for the new idea on something I have been making for years…granola! I wouldn’t add dried fruit to this in the oven; it would get too chewy and probably not set. You could eat it with dried fruit, absolutely. Yes! This is my go-to granola recipe and I’ve made it so many times I can walk in the door and have a batch in the oven in like ten minutes flat. I start with the base and just throw in whatever add-ins and spices I have handy. I love that it gives a nice variety of chunk sizes. This recipe has egg white in it, so I’m guessing it’ll be even crisper and chunkier. I usually bring granola to a friend of mine and he loves to just snack on it by the handful, so I’m gonna have to try to addition of the egg white to make it even more finger friendly. Deb, I’ve been making my own riff on granola for a few years( via Joy the baker) and so like you are always on the lookout for new recipes. Lucky me I live in SF, so can visit The “Tartines” when I want/need to! Also read an interesting article by Pruitt, talking about her gluten intolerance, but that she can eat the Tartine bread( as you know her husband is the other half of that awesome duo) because of the unprocessed grain he uses. No surprise many of our newer health problems are related to processed foods, right? Anyway, this recipe looks great. Making your baked ziti tonight, can’t wait. Also Dorie Greenspan’s granola cake is a winner, if you haven’t tried it yet. Yes! I didn’t know how much to get in to the gluten-free aspect of the book because I saw some negative reviews on Amazon from people who hadn’t realized it was going to be so I didn’t want to surprise anyone, but as you say, it’s not a total thing for her. She uses Chad’s bread in a few recipes. 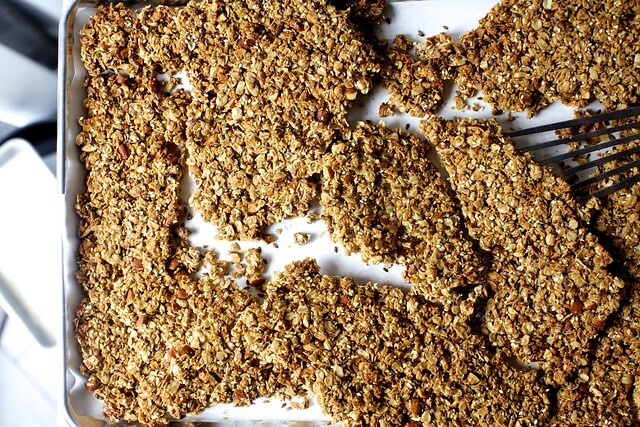 If I bake this crack – I mean Granola bark – I MAY EAT IT ALL IN ONE SITTING! I nearly LICKED my screen. OH my OH my! I know you mentioned substitutions above, but curious if anyone has experience with subbing out the coconut? We are unfortunately coconut haters in my house. Do I just use just more oats? A combo of oats/nuts/seeds, keeping the same total volume? Some chopped dried fruit to give that chewie-ness that I would associate with dried coconut? I would go with more oats for that lightweight flakiness and in this case. You might find you need less. A mix of more oats and sliced almonds might work too, since they too are light and flaky. Reporting back – I went with 1 cup chopped whole almonds, 1 cup sliced almonds, and 1/2 cup pepitas. It turned out great! My only comment is that I used chia seeds because they were cheap in the bulk aisle of my grocery store, but the seeds get stuck in my teeth like crazy. Next time I might opt for the flax, or make some more subs. Can the flax seeds be left whole as well? I have a whole bag my grandmother gave me and nothing to grind them with! I use whole, it can be either. I just use my bullet or food processor to grind up whatever I’m using per recipe, or do a cup or two at a time if I know I’ll use it up quickly. It’s easy I swear! Interesting. Isn’t that why we chew our food? I would think our teeth would break up flax seed? We do chew a small percentage of whole flax seeds, but they’re simply too small to chew them all. I use both whole and ground, but I’ve never really worried about the whole seeds, as I see them as extra fibre, with bonus nutrients if I happen to chew some up. I thought I needed a spice grinder or flax seed grinder like my mom gave me in high school when she was into adding freshly-ground flax seeds to breakfast cereal. I’ll have to try the food processor. Thanks! Can’t wait to make this to help with my constant pregnancy hunger. Can I substitute Bob’s Red Mill gluten-free flour for the almond flour? I wish someone could give me a hint on how to chop large (1 1/4 cups is large to me!) quantities of raw almonds. You just can’t get it right in a food processor…too many big chunks and then powdered almonds, but it seems to take forever any other way. Not to mention the almonds jumping all over and off the cutting board. I would guess a very sharp and heavy knife works better, but even that does not solve the problem. Agreed! I’d like a tip if there is one also. I just buy sliced almonds for recipes like this, I really only use whole almonds for making spiced nuts or snacking. The best thing I’ve ever had for chopping nuts is the food chopper as-seen-on-tv thing (I think my moms version was actually pampered chef, but same idea). You know, the late night infomercial one? I think it was called slap chop or something. It’s silly but it really does work to chop up nuts much better than a processor and helps keep them contained. Alas, I don’t have one so I’m stuck with the jumping almonds. I was watching Martha Stewart on TV this Saturday and she has an interesting trick on chopping nuts. She was using two knives, holding the handles with one hand and the tips with the other while she chops. I’ve never done this but she swears by it. 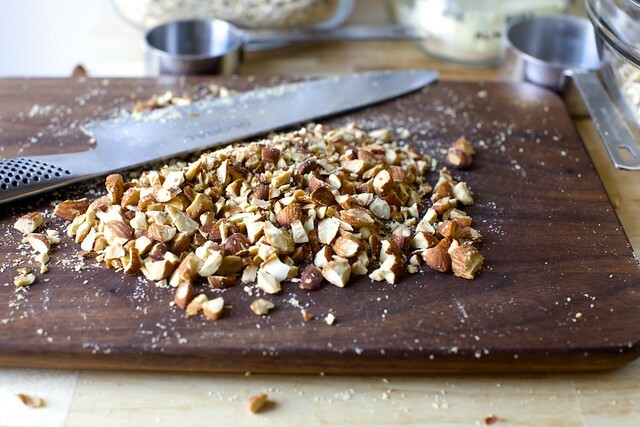 A large serrated knife works best for chopping hard nuts like unblanched whole almonds. The deeper the serrations, the better. This type of knife ‘bites’ into the nut while putting downward pressure on it and keeps it from skittering around the cutting board. I make a narrow band of nuts (about half the width of my knife blade) down the length of my cutting board and chop along the band of nuts until I have the size of pieces I want. Repeat as needed until you have the amount of chopped nuts required. JP, I have the perfect tool that solves your nut chopping dilemma. It looks like a round biscuit cutter, but rather than straight edges, it has scalloped sharp blades. It easy to control the size of chopped nuts in a bowl. I grew up with this tool and as each family member left the next, mother would purchase one for us. We use for chopping egg salad, strawberries for shortcake, and always nuts for a variety of things. It’s small for storage purposes and I don’t think costs more than $5. I’ve had mine for over thirty years. I tried to post a picture but I can’t insert an image in the comment field. Do you, by chance, know what this item is called? I don’t think I have ever heard of it. Thanks! I found it on Amazon, called: Kwik Kut Serrated Tooth Edge Manual Food Chopper, only $5.99. Works like a dream. I have a vintage nut chopper, the kind with a crank that screws onto the top of a canning jar. [Searching for “vintage nut chopper” will show dozens.] It only holds about a quarter of a cup at a time, and I sometimes have to pass the nuts through more than once, but it’s worth not having to make a mess using a knife. Using slivered almonds in it is even easier. I put nuts in a ziploc bag and smash them with the bottom of a jar or a rolling pin. Try putting the nuts in a big bowl and using a pastry cutter on them (must be the stiff blade style of cutter, not the kind with the flimsy wires). These bars look amazing! I can’t wait to try them tonight! I just saw an amazing interview with Elizabeth last week and I cannot, for the life of me, remember where it was. Lucky Peach? Eater? LA Times? Was it you? I have recently had to veer into a gluten-free lifestyle NOT OF MY CHOICE and was so excited to read that her newest was full of recipes that I wouldn’t have to adapt. So happy to hear a good review of it. She’s been doing a lot of press for her new book, so I’m sure she’s been everywhere. I read this in Lucky Peach last year; I enjoyed her honesty about the work/life thing with kids. I met her at the Cherry Bombe Jubilee, a one-day conference, last weekend and totally fangirl-ed out. She was being interviewed by Christine Muhlke and it was nice to learn more about how Tartine came to be. I am trying hard not to eat sugar, so either I would vastly change this recipe or just make oatmeal. But you keep bringing up this Tartine All Day book, and, as I live in France, where tartines are not all day, but certainly at lunch from 12 to 2, I just could not wrap my head around it. But it seems to be a lot more than just tartines, so I will have to check it out. Sounds like Las Vegas was a good idea! Oh yes! granola for the win! I’ve been making my granola with egg white for a while. It really does the trick on the crispy front. I like whisking the vanilla in with the egg: slightly easier to froth. I think you’ll find these pleasantly mildly sweetened, i.e. I would advise against reducing it. The sugar provides both flavor and glue. I used all maple syrup, brown sugar, chopped pecans, and substituted wheat germ for the nut flour. 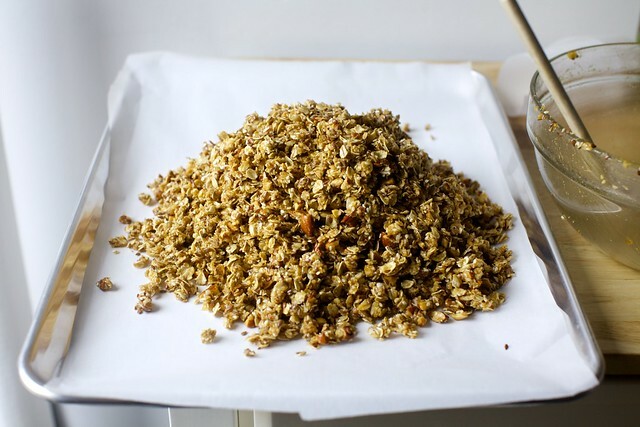 It was so easy to mix and press down with a wooden spoon to create a big sheet of granola and large chunks- the best! Mine was perfectly toasted and dry around 35 minutes. I am glad I did not adjust the sugar because it is not too sweet at all! We have a nut allergy in the family (but not anaphylactic) and we successfully substitute pumpkin seeds and sunflower seeds by volume in any recipe that calls for nuts. OMG THIS LOOKS AMAZING!!! Absolutely genius! 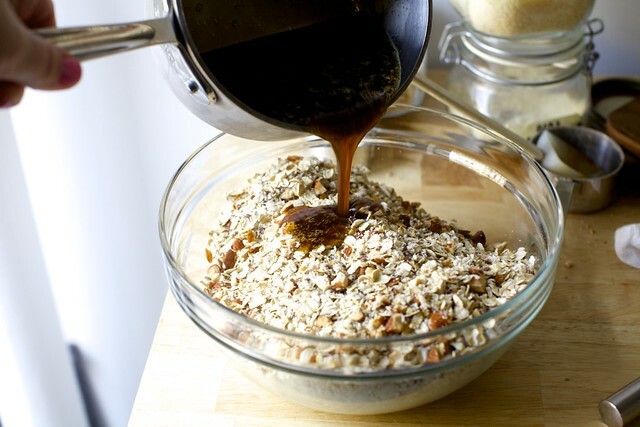 I really love chunky granola so I might just make this and smash it into pieces for breakfast <3. I'm gonna be going to New York in a few weeks and would love to hear some recommendations! Dammit. If I wasn`t fasting today I would make this, bake this, then eat all of this. Fab work. Regarding the chopping of whole almonds, I agree it is a pain! I have a fair amount of success by putting in a plastic bag and strategically smashing with a small but heavy saucepan. Check often that they are staying somewhat even. If you roast them first they tend to break more cleanly. Not as mushy. Just make sure that they have cooled completely. Good luck!. Hi…this looks delicious. I plan on making it for a hiking trip in Arizona that I have coming up. Do you think I can add any dried fruit? Also, what would the substitute be for the almond flour? I’ve never used that before. If a nut flour is best, then I’ll be purchasing some. I’m pretty sure I’ll be making this more than once. Thank you. If you don’t wish to buy a nut flour but have a good blender or food processor, you can grind what you have until as fine as it gets (without turning to butter). You cannot add dried fruit to the bark (it would bake, get chewy and burnt) but no reason you cannot add it to the jar or the bag you’ll bring with you. I just made this and forgot to put the flour in and it’s still delicious. I had granola on my to-do list yesterday so made these right after I saw the recipe. I cut the sugar back a bit (~1/3 cup honey/brown) and did not have nut flour and have no fear of gluten so just added a little wheat flour. (But the wheat germ tip someone had is brilliant for this, I’ll try that next time, or just blitz some extra nuts). I love the final texture and how the water mixture distributes the sweetness and egg to the entire batch, so will do this again. I don’t like my breakfast granola quite this sweet so may just skip the sugar next time and see if it still holds together as well. Flax is a great idea, I like the color and texture it adds. What brand of maple syrup is pictured above? Is it your favorite? OK, I will take a look. You made me do it!! I have had mixed results from all of their books! Love your blog and have a PILE of printouts from your recipes. Thank you for all the time you put into this!!! I’ve been reading your blog since the time before children (both mine and yours!) but have never commented before. In all sincerity, thank you for teaching me how to cook. I’ve been using the NYT olive oil granola recipe as my go-to for many years, and I find that I achieve similarly chunky results from 1) baking for the full 45 minutes without stirring, and 2) letting the granola fully cool on the pan before breaking it. 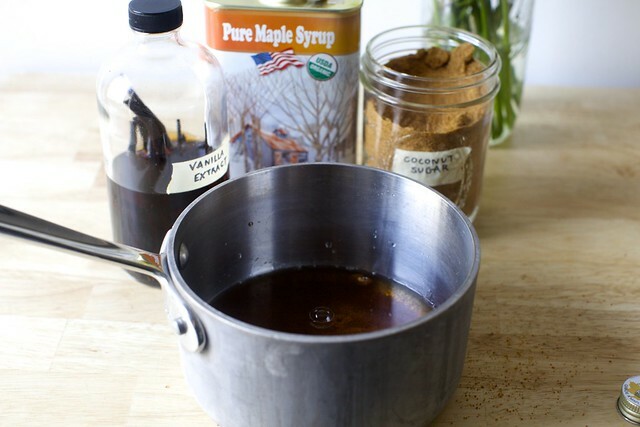 I also reduce the brown sugar in the original recipe as the maple syrup makes it plenty sweet. Thanks for this comment. I love the olive oil granola recipe from the NYT but recently have been trying (unsuccessfully) to make it clump for eating out of hand on a backpack. I’ll employ your technique along with a little tweak of my own – reducing the oats just a little to increase the proportion of liquid to solid. I’ll also try this bark recipe because it really looks appealing and almond granola – how can it be bad! Maybe this is a dumb question, but how do you eat this? Like granola bars for a snack?? Or broken up in a bowl with yogurt or milk, a la breakfast? I think I want to make this. I think I want to sell this to my kids as their new snack because it looks much easier to make than coooooookies. But would love some tips on how people are eating this, please. Either, or all of the above. Crumbled over yogurt and/or fruit. In big chunks as snacks. I haven’t done the granola-in-milk thing (I work so hard to make it crispy!) but I definitely think it would work too. I love it with coconut milk. Hits all the cereal and milk notes, but the thickness keeps it crispier longer. I used maple syrup, brown sugar, almonds and walnuts, toasted sesame seeds, and WW flour. I split them up and added cinnamon, nutmeg, ground chives and allspice to one half. They turned out really good! The sesame was a little strong but it’s all I had. I’d like to try toasted millet next time! Deb, I’m surprised no one else caught this: in your final instructions, you say, “Once totally cool, …” Um, how do I know when I am totally cool? Anyways, I love granola and have been doing a riff of yours for like ever. I’m gonna make a big batch of this today, so I can have super-fast ready-to-go breakfast. Hi Deb, is there anyway to “vegan-ize” this / what is the reason for the egg white? My regular granola recipe uses maple syrup and orange juice instead of honey. I think a flax egg would work perfectly here, especially since flax is already an ingredient. I made this today and it was delicious using avocado oil, as it’s so buttery while not being heavy at all. So fond of saying “Granola Bark!” – makes me think of my dog every time:) Thank you for another winner! I love a granola that clumps this well, but I prefer less sugar and fat. And def no egg. I find that two tricks really work: grinding a small amount of the dry ingredients to make a powder before combining with liquid. And leaving the granola in an off oven after baking for an hour. I substituted raw sunflower seeds for the sesame seeds and added a cup of mini chocolate chips–otherwise followed the recipe as printed. Turned out great! I just finished this and it does indeed hold together! I’ve been searching for a granola “bar” recipe that is more easily portable for long car trips and bag lunches, etc, and had never thought of the egg white idea. It works like a charm. I replaced sesame seeds with hemp seeds because I’m not a fan, and also used ground flax instead of seeds because it provides extra binding. I definitely would describe it as “lightly sweet” which is perfect for me, but anyone used to store bought brands may find this version much less sweet in comparison. I also used coconut oil but might try butter next time. Thanks for finding me a crunchy granola bar, Deb! Deb, it looks like you’re using a restaurant half sheet pan. That’s what I use at home and a half sheet or quarter sheet pan doesn’t come anywhere near 13×8. Are you not using restaurant sized pans? I am using this half-sheet 13×18-inch pan (I know because I just bought it). Quarter-sheets, I have many many from years of having an oven that didn’t fit half-sheets, are 9×13-inch. I think this recipe ia very forgiving! I made a lot of substitutions and it still turned out fantastic, and very very crispy! In Greece we can only get quick cooking oats, so that’s what I used. I had no coconut, and used another ciup of oats instead. I had no whole almonds, so I used flaked. I used half honey and half syrup from a bergamot spoon sweet I had in the pantry. I baked at 160 C for 45 minutes. Delicious. Thanks, Deb. Oh, and I forgot: I had no almond meal, so I used 1/2 cup of crushed digestives. I’ve been looking (and have tried several) recipes for a more bar like granola, something to pack in lunches easily. When I saw these, I immediately made a batch. However, I used regular flour as we’re ok with gluten and to buy a nut flour is ridiculously expensive in Asia. They turned out perfect and I don’t think they’ll stick around too long. I put half in a resealable jar and half in a bag in the freezer. The humidity here makes things go soft very quickly and since this makes a lot, didn’t want it to go to waste. Thanks for the great recipe. Fantabulous! I was out of almond flour, so used a little whole wheat flour instead. Turned out great — I’ll have to try not to eat the whole batch in a day! I make my own almond milk. Is the leftover pulp good for a recipe like this one? I always freeze the pulp after straining the almond milk and am looking for ways to use it. Thanks for any information you could give me. Do you toast it so it’s dry again? If dry, it might work for almond meal or even another seed here. Haven’t dried it…just freezed it after I strain the milk. I will dry some in the oven and see. Deb- took a lot for me to venture from your thick and chewy granola bars, which are my morning staple… but I must admit that these are delicious. One question: do I really have to whip the egg white? that was an unwelcome direction in an otherwise speedy recipe. thanks!! I just whisked mine with a fork a little and it worked fine. Was pretty crisp. Yes, that’s all that I’d meant, just to whisk it (I, too, use a fork) until loose (frothy meaning bubbly/slightly foamy, not thick) so it mixed better. Not whipped as if you were making a meringue, which would definitely be annoying. Sorry for the confusion. Wowswers – this is a great recipes, garnering immediate raves. I substituted white whole wheat flour for the almond flour, and used 115 grams of walnuts for the flax and sesame seeds. Worked great! The next day was very humid and it went a little limp, but I just recrisped it for about 10 min in a low oven and it was fine. Thanks for all the great recipes, Deb! I can’t eat flax or tree nuts, so, used cashews and made cashew flour/meal in place of almond, and added about 1/2 as much additional chia seeds in place of flax. Good stuff! Love the crunch. It’s really good as a vehicle for ice cream. I need to admit that my mis-wording might make someone sick. Cashews are a tree nut but I was thinking non-tropical, such as walnut, almond, pecan. Apologies! I folllowed the recipe to the letter except I added sunflower seeds. It was so easy! I also just smooshed it down with a wooden spoon. Worked fine. I have given it away to friends and family and everyone loves it. I will definitely make it again and try experimenting with different spices. I also like the idea of a little chocolate drizzle after it cools. Thanks Deb! This recipe is perfect and should come with a warning that it’s addictive. I just made it this morning and ate some with a bowl of oatmeal, drizzled with honey. Swoon. Made it today…it’s really good! I added raw sunflower seeds and there wasn’t any problem. Mine was nice and brown at about the 30-35 minute mark. Make sure you are keeping an eye on it so it doesn’t burn! I made this without the egg. I substituted 2 T of aquafaba whisked until frothy for the egg. Turn out nice and crisp. I made this because the photo was mouth-watering. I am not gluten-free so I don’t spend big bucks on ingredients I won’t use like almond flour and flax seeds, but some of my book club friends are so I stayed true so they could eat it. I subbed coconut flour (much cheaper) and used more oats and sesame seeds to make up for missing flax. Pecans instead of almonds. Other than not being sweet enough for my taste, it was a hit. Next time I’ll drizzle chocolate or honey on top. I think it would be excellent to break up and top yogurt with, too. Wow… this looks absolutely delicious. I don’t eat granola too often but the idea of making my own bark appeals to me a lot. Is there anything that one could use instead of Coconut? My daughter hates it and can smell it a mile away (sigh). 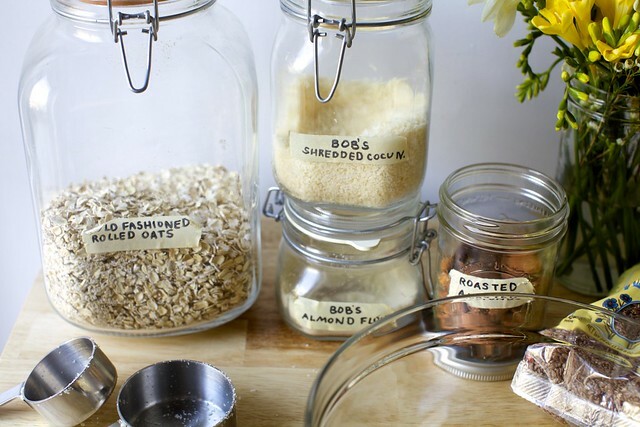 I might use additional oats or flaked almonds; try swapping by weight instead of volume. Baked this over the weekend. Forgot the coconut! But it was still very good. I was surprised of the lovely flavor given that there is no dried fruit included – didn’t miss it! I made it using the half honey/half maple syrup suggested. I am interested in trying this out, but really am averse to spending $14.50 for almond flour or, even worse, $17 for hazelnut flour. We’re not at all gluten-intolerant (and so few people truly are) nor do we suffer from celiac disease. Would whole-wheat flour work, d’you think? You can also grind or chop nuts very finely and not have to pay the markup for a bag of nut flour. really liked how this turned out. used millet instead of chia seeds, roughly 50/50 pecans/almonds, and halved the cinnamon. for scale addicts (read: too lazy to wash measuring cups) like me – maple syrup (158g) and olive oil (72g). Super good! I didn’t press down hard enough on the mixture and some of the batch wasn’t as crisp. Lesson for the next time I make it…and there will certainly be a next time. Thanks, Deb! A winner!!! OMG, so good. And it makes so much! This is going to last me forever! Next time I make this, however, I will probably lower the temp and raise the racks up higher in the oven…I found the edges and the bottom got a bit more cooked than I would have liked after 40 minutes. Still absolutely yummy, but a hint of that bitterness you mentioned in your instructions. I am finding that maybe my oven runs a little hotter than yours, as things tend to get overdone when I follow the recipe’s timing (and yes, I do use an oven thermometer, but I’m guessing I have some hot spots or something–it’s a garbage oven that came with the place I’m renting). But I’m thrilled–last night I crumbled up some of the granola and topped it with Greek yogurt and blueberries and it was absolutely heavenly. I think I’ll bring some of this stuff to my office for the occasional snack during the work day! I found what may be my supreme use for this almond granola: Cherry smoothie. I pitted about a dozen fresh sweet cherries (just coming into So. Cal. Farmers markets) and added them with some of the looser granola, milk and a few ice cubes to my blender carafe and let it whirl. I added a little more coconut (in tiny shreds) once things started to even out. When it was smooth enough to pull through a straw, I served it with more almond bark on the side. I made this with chocolate, and it is delicious! When I took it out of the oven, I put chocolate chips (1 bag of Ghirardellis 60% cacao) on top for about 5 minutes and then spread it around. It didn’t quite cover the whole thing, but it’s nice to have some pieces without chocolate. Other changes: regular flour, pecans instead of almonds, and no sesame seeds. Thank you for the delicious recipe! My 12yo son likes it, too! I made 2 versions of this for Mother’s Day Brunch yesterday. One with almonds and coconut oil; one with pecans and canola oil. All other ingredients were used as listed. Both were a HUGE hit!!! Will be making this on a weekly basis for sure. This was a huge hit with my family. The sweetness is subtle (this alone makes this granola a winner if you’re tired of the hyper-sweet commercial stuff) but it has great roasted complexity that balances it all out perfectly. 10/10! I’ll have to try this. I make homemade granola often – this looks great! I made a 1.5 batch, because we always go through granola with lightning speed. I found that the single egg white was still enough to crisp the granola completely, and didn’t even have to add additional baking time (mine were perfect after 48 minutes). I used half walnuts and half almonds, because I discovered too late that I was low on almonds, and I found it to be a very welcome substitution. I did not add coconut flakes (don’t like them) or chia, flax or sesame (trying to keep it budget conscious) and the texture still turned out perfectly, didn’t have to adjust any of the wet ingredients at all. Thanks Deb, so delish! I make a version of this weekly from a similar recipe originally from ATK. Being diabetic, I use sugar free maple syrup and Splenda brown sugar blend and it’s delicious. I change up the nuts often but pecans remain my favorite. Crumble it into plain yogurt for a healthy low-carb lunch. 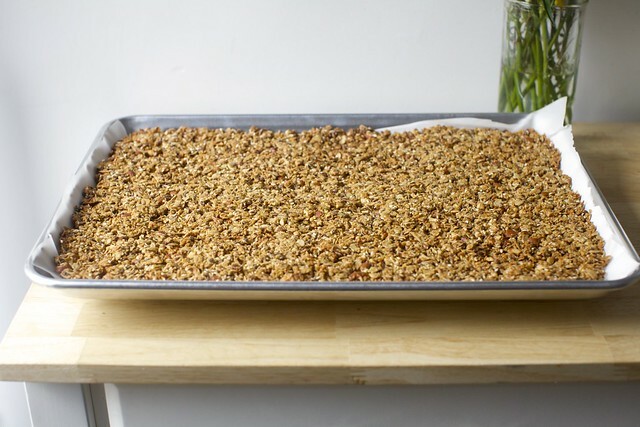 This reminds me of my favorite Granola recipe from Cooks Illustrated – now the ONLY recipe I make – also flattened in a sheet pan into a “bark.” I am a granola affectionado. The technique is perfection, and so much easier than stirring all the time. I prefer just nuts, not fruit. Will likely try this one, too. The Cooks Illustrated is “sheer simplicity,” with the oats and almonds taking center stage. Does anyone have a sub for the almond flour to make this nut free? I was thinking I’d replace the almonds with sunflower seeds and pepitas. But I’m not quite sure what to do with the 1/2c of almond flour. maybe cocoa and ground oats? I do not like coconut in baked goods, yet every granola recipe I see contains coconut flakes. I appreciate the trade of same-to-same but not sure how to trade out the coconut. Can you please advise? This is now our standard household granola recipe. However, I recently coated some with dark chocolate, broke it into cookie-sized pieces, and gave a tinful as a gift. It was VERY much appreciated! I don’t like coconut, so many granola recipes call for it. What is a good substitution for it? I’ve made with and without. No probs. I like it better without. I’d use more flaked almonds, or oats. I make this recipe at least monthly, leaving out the coconut and adding more nuts and pine nuts in its place. Heed the advice to open the oven a few times to release steam, and consider overcooking for those crispy/almost burnt edges! If you absolutely abhor shredded coconut, can it simply be omitted, or should some other ingredient(s) be upped in volume to compensate? Wow! I made this to take with family on a winter break visit to NH. Excellent results (not that I’m surprised, since I make SK recipes all the time!). Not too sweet, as some have commented, which is how we like it. Thanks once again, Deb! Third time making and delicious as ever. I love all the substitution options. Allows you to use up small bits of nuts you have in the fridge. I do 1/2 honey and 1/2 maple syrup. Added walnuts this time as well as wheat germ. Bringing some to a new mama today. Liked someone else’s suggestion that it can be eaten one handed, which is perfect for her. Thanks, Deb. What is the function of the egg white in the bark? The smell alone is worth making this. It just came out of the oven and it is delicious! Not too sweet and incredibly crunchy. This is devine, just recently took your book out of the library was going to make the oat brittle when I saw this on your Intragram, loved the ingredients so gave this a go instead, like I said devine, perfect in every way. Thank you.